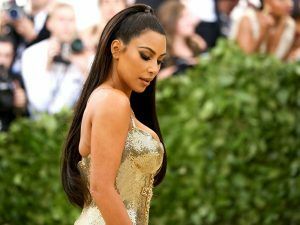 🔥🔥🔥🔥 Kim Kardashian West pulled out all of the stops for the Met Gala , going head-to-toe in sparkling gold. The Keeping Up With The Kardashians star opted for a custom Versace chainmail gown with spaghetti straps, featuring beaded Byzantine cross motifs as a nod to this year's theme; Heavenly Bodies: Fashion and the Catholic Imagination. The 37-year-old - who made headlines last week after unveiling her KKW Body perfume bottle, which celebrated all of the hard work that she's been putting into the gym by immortalising her figure - was clearly keen to show off her hourglass shape, cinching her dress right in at the waist. Kim's glam was on point too; the reality star opted for a super sleek half-up half-down ‘do (yup, we're getting total Ariana Grande vibes) and a heavy smoky eye.